BCL: Curtis and Mae, what inspired you to begin collecting candy for our troops? So, the following year, I wanted to do that as well; and I knew about another organization that was here in Los Angeles called Operation Gratitude that was already making care packages for troops. Operation Gratitude would gather all kinds of sundry products like toothbrushes, shampoos, and other small items to give to the troops. In those days, the war in Iraq was going full bore, and there were tens of thousands of troops that needed our support with care packages. 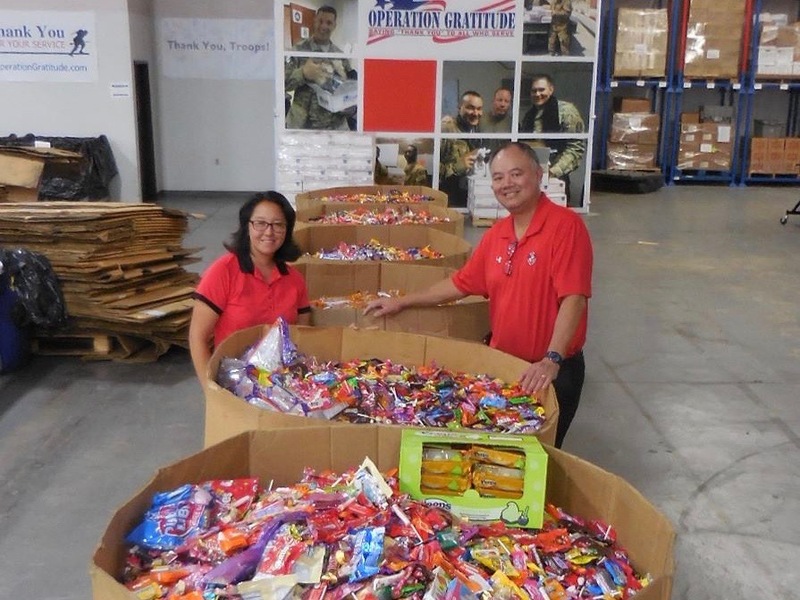 Operation Gratitude in Los Angeles made a request for all of these sundry products; but they also said, “If you have any excess candy, please give it to us because we use it as stuffing to completely fill out the boxes. So, some other local dentists and I decided to use Halloween as a time to maximize the opportunity for kids to donate their candy back to the troops. I have four kids and see how much candy they get. I realized it would be a great idea to turn Halloween around and give the candy to a better cause. The first year we probably collected about 500 pounds of candy, and we thought, "Oh, that's amazing!" All of a sudden, my dental office was full of all these bins of candy. United States Marine Corps troops giving a helping hand at the Candy Buyback event. The following year, my wife, being a marketing guru, started promoting it in different ways. We would buy some of the candy back on a certain day, and kids would come in and feel proud that they were donating their candy to support our troops. Eventually over the years, we actually had troops present. We interfaced with Camp Pendleton [in Oceanside, California] and got a few of their troops to be there, so that people could actually come and physically thank a troop member or write a letter for Operation Gratitude to give to troops overseas. We ended up promoting the event to the local schools and asked the principals, "Hey, why don't you participate with us?" So rather than getting 500 pounds every year, we started getting thousands of pounds and tons of candy. We're up to eight thousand pounds. How many schools do you work with, and are they public, private, or both? We work with thirteen of the local schools, both public and private, and two churches—so fifteen total right now. And everyone just loves the idea. It's not about just buying the candy back. The kids participate in the event, and because it's also close to the Veteran's Day holiday when we remember our troops, it's a good time for the teachers to be able use the event to focus on honoring our veterans and people who are still fighting abroad. The United States has been in conflicts for the last ten to fifteen years. We know about it, but we don't pay attention that we have fighting men and women—tens of thousands of troops who are in harm's way—who need to be remembered. Operation Gratitude continues to send these care packages, which costs them $10 each at least to ship. At the Operation Gratitude center, every week they have thousands of people bringing stuff in, and then they have days when they assemble these packages. Our candy acts as a stuffer to fill every little air pocket. When the troops get a package, there will sometimes be DVDs in there, shampoo, Chapstick, and sometimes a scarf. Sometimes there's a beanie baby in there. The care packages may contain cookies and, of course, the candies, and then there's always a note of gratitude somebody has written to thank the soldier. These boxes will go all over the world—to Korea, the Middle East, to troops in the submarines. Dr. Chan rents a U-Haul truck each year to take the thousands of pounds of collected candy up to Operation Rescue in Los Angeles. When do you start getting the word out about Dr. Chan’s Candy Buyback for the Troops? We send press releases to all of the news stations and radio stations. We contact schools about three months in advance because a lot of the schools are in the process of taking out their fall calendar, and a couple times we missed the deadline to get on the calendar for service opportunities. Do you actually pay the children for their candy? We do. There is only one day we will pay them. I pay them a dollar a pound, up to five pounds. They can bring a big sack full of candy, and they make up to $5. Every parent is always thanking me for taking the candy off their hands, because they don't want it! You would be amazed at how much candy comes through just this community. It's mind-boggling, because I'll have a huge U-Haul truck—a 16-footer—and that vehicle is maxed out to the roof. We heard that a picture of your family with a load of candy is being featured on some U-haul trucks in the southern California area. What a lot of people don't realize until they research it is that the troops are not always consuming all the candy they receive. They actually welcome the candy because it gives them a vehicle in these far-reaching areas like Iraq or Afghanistan to be able to communicate with the local kids in their community and learn about where the bad guys are. The local children know the troops may have candy for them, and they want to talk to the soldiers. So, this candy becomes an interface for intelligence gathering. There are many stories. If you go on the Operation Gratitude site, you'll see a lot of letters in which these guys tell how much they enjoyed the treats they got—and the beanie babies—because we do collect beanie babies too. Children with the letters of gratitude they have written for overseas troops. On the candy buyback day, we will have a table set up in the office; and in order for kids to leave with some of the goodies we give them for coming and participating, they have to write a letter to one of our armed service people and they can decorate it. We've actually had schools make big gigantic posters, and the children all sign it. When Operation Gratitude gets it, they cut it up in pieces to transport it. When they send it to a squadron, it's all rolled up and might be in pieces. The squadron tapes it back up and puts it on a plywood board to display it. They're just so happy to have it. Who does most of the work for the candy buyback between the two of you? Mae does ninety percent of the work. I'm the face, but Mae does most of the work. Do your children get involved? Yes, on the day of the event, they'll be here participating. My whole dentistry team participates. We shut down the office for the whole afternoon just to be ready. We have a prize wheel, and we'll raffle off an iPad mini and a gift basket—things that make it fun. How do the other dentists in the area participate? We'll probably have at least ten to twelve other dentists that will bring their candy for us to transport, which takes the burden off of them. What is one memory in particular that stands out to you in the years you've been doing this program? The biggest thing that we really love is having these young Marines come to our office—usually around four to five each year. We get to know these young men who are eighteen, nineteen-years old and living away from home. After our event, we always invite them to our home for a home-cooked dinner and conversation. They are so appreciative. And then we find out where they are going for the holidays, and most of them can't afford to go home. We invite them over for Thanksgiving dinner or during Christmas time, and it's just a way to reach out to them. I grew up in a family that was always about being hospitable and giving back. That's what the Lord wants for us. BCL has one final question for you, Curtis, while we have the chance. Which is more important: brushing or flossing? That's a question my office hears fairly consistently. Nobody likes to floss. I always say, “You don't have to floss. You just want to floss the teeth you want to keep.” That's the answer! Brushing is important, and flossing is equally important. You really have to do both. Thank you so much, Curtis and Mae, for taking the time to share with Beautiful Christian Life about Dr. Chan's Candy Buyback. Some of our team may stop by to join in on the fun at your next event. It’s always a party—please stop by!